Jonathan Holloway’s grisly adaptation of Robert Louis Stevenson’s classic novel The Strange Case of Dr Jekyll and Mr Hyde returns to London for a short run at the Platform Theatre at Central St Martin’s. This macabre and melodramatic portrayal of Jekyll & Hyde delivers some interesting twists to the classic we all know and love. In this version, the story begins in old Hong Kong at the turn of 20th Century. A mysterious merchant is attempting to sell a manuscript to a shrewd and rather sceptical young newspaper reporter. He cajoles her into listening to first few pages of his story; a tale about a young and earnest solicitor, Henry Utterson, who is somewhat perplexed by the latest actions of his respectable client Dr Jekyll. We discover that Dr Jekyll has bequeathed his entire estate to the dastardly and thoroughly reprehensible criminal Mr Hyde. 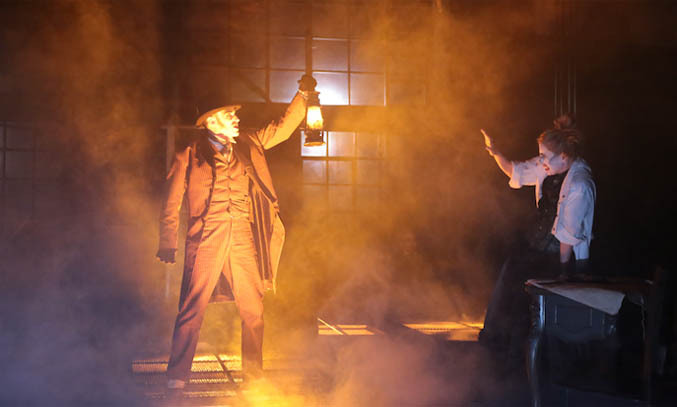 More alarming still is Dr Jekyll has requested for his property and possession to be handed to Mr Hyde should Dr Jekyll ‘disappear’ for a period of 3 months or more – even without an explanation for his disappearance. Concerned that Dr Jekyll is being manipulated or blackmailed by Mr Hyde, Henry decides to pay his client a visit, for what appears to be the first time. Heading up this cadaverous cast is the peculiar Dr Jekyll who, in this adaptation, is a female scientist originating from Eastern Europe. The script briefly alludes to a troubled past in her war-torn home country where she claims to have suffered unspeakable torture and suffering. She has come to London to continue her mysterious ‘work’ free from persecution. Utterson is, somewhat inexplicably, smitten by the curious Dr Jekyll and it’s not long before he enters into a relationship with the disturbed doctor (who claims that Mr Hyde is actually her cousin). Before he knows it, Henry has become entangled in her web of lies and deceit to protect her cousin from the ramifications of his abominable crimes. As the story unfolds, their relationship breaks down; culminating in Utterson’s gut-wrenching realisation that Dr Jekyll has actually been experimenting on herself with a mind and body altering tonic and that she herself is, in fact, the abhorrent Mr Hyde. Actress Olivia Winteringham delivers deliberately hammy and, thus, rather entertaining portrayals of Dr Jekyll as a reclusive mad scientist and Mr Hyde as a repulsive rogue. Better still is when these are poignantly juxtaposed with references to the doctor’s dark and tragic past. The staging is ambitious and convincing as both late 19th Century Hong Kong and gothic London. The supporting cast is solid and the two narratives are woven, on the whole, seamlessly together. It’s not a masterpiece but it’s definitely worth seeing while you have the chance. Jekyll & Hyde runs at Platform Theatre, King’s Cross from 28 July to 8 August 2015.